At Sulema Designer Permanent Cosmetics we use face analysis to achieve beautiful results and a natural look. Individual Hair Strokes drawn in a designer shape custom to each face. This is done with an advanced embroidery technique which appears more realistic. This process will create 3-dimensional, natural-looking eyebrows for women and men. Microblading is a method of applying semi-permanent makeup to the eyebrow to make it look like real hair. The embroidery technique creates a 3D textured effect and gives the illusion of real hair. This is done manually with a microblade. 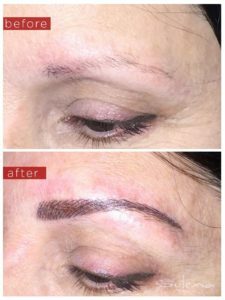 By adding multiple single hair strokes in the direction of the existing hair, the eyebrow can be filled in and re-designed to create the perfect brow shape. Fill in gaps, re-design or fill in over-plucked brows.